ISS final policy updates cover four key areas: (i) board of directors, (ii) shareholders rights and defenses, (iii) capital/restructuring, and (iv) social and environmental issues. No updates specifically relate to executive compensation. Equally important, ISS chose not to issue a final policy update modifying in its pay-for-performance (“PfP”) quantitative model to replace GAAP-based metrics used with Economic Value Added (“EVA”) metrics. ISS will phase-in its new policy on board gender diversity, which is substantially similar to the proposed ISS policy. Current policy. 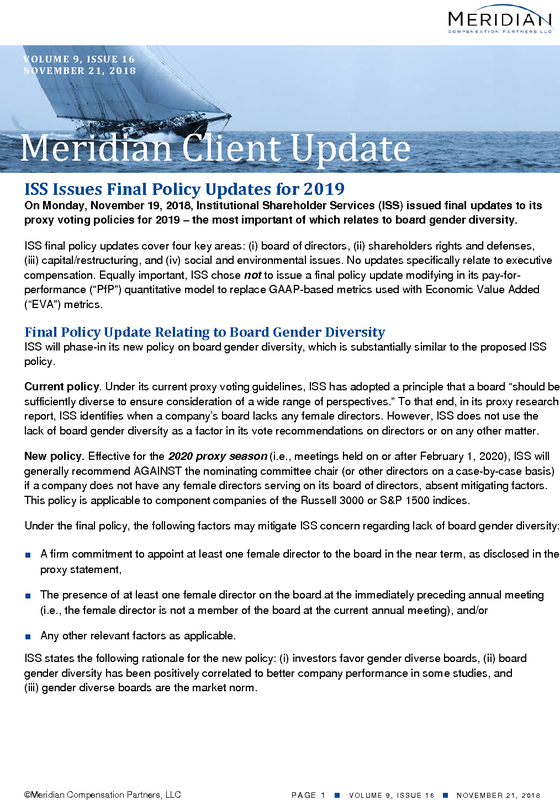 Under its current proxy voting guidelines, ISS has adopted a principle that a board “should be sufficiently diverse to ensure consideration of a wide range of perspectives.” To that end, in its proxy research report, ISS identifies when a company’s board lacks any female directors. However, ISS does not use the lack of board gender diversity as a factor in its vote recommendations on directors or on any other matter. New policy. 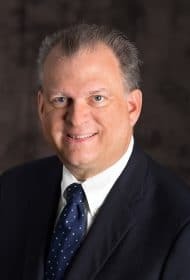 Effective for the 2020 proxy season (i.e., meetings held on or after February 1, 2020), ISS will generally recommend AGAINST the nominating committee chair (or other directors on a case-by-case basis) if a company does not have any female directors serving on its board of directors, absent mitigating factors. This policy is applicable to component companies of the Russell 3000 or S&P 1500 indices. ■ Any other relevant factors as applicable. ISS states the following rationale for the new policy: (i) investors favor gender diverse boards, (ii) board gender diversity has been positively correlated to better company performance in some studies, and (iii) gender diverse boards are the market norm. The other final changes in ISS policies relate to: (i) board composition, accountability and responsiveness, (ii) reverse stock splits, and (iii) shareholder proposals on ESG matters. These policy updates reflect modest changes to existing ISS policies, generally affect few companies, and are non-controversial in nature. ISS did not revise its quantitative PfP model for 2019. ISS had proposed replacing the current GAAP-based financial metrics with EVA metrics used in the relative financial performance assessment (FPA) component of the model. However, in 2019, ISS will continue to use GAAP-based financial measures in the FPA and will include EVA metrics in its reports solely for informational purposes. ISS explained that feedback received from investors indicated that “investors would like more time to fully understand the EVA methodology and its potential to add additional insight to pay-for-performance evaluation.” ISS states that it “will continue to explore the potential for future use of EVA” in the FPA for 2020 or later proxy seasons. Meridian Comment. ISS’s final policy on board gender diversity appears to strike a reasonable balance between promoting board diversity and imposing quotas. In line with the final ISS policy, we expect that companies will increasingly focus on the gender composition of corporate boards and explain in proxy disclosures and investor engagement why the current board includes an appropriate mix of individuals, the factors considered in director nominations and refreshment, and actions taken to improve board diversity. ISS’s decision to not replace GAAP-based metrics with EVA metrics in its quantitative pay-for-performance methodology is not surprising, given that a plurality of both investors and non-investors indicated that ISS should continue to use GAAP metrics in the latest ISS policy survey. However, ISS’s decision to include EVA metrics in 2019 reports, and to further consider its use in the FPA for 2020, appears to confirm an ISS strategy to sell EVA consulting services to public companies through EVA Dimensions, a recently acquired firm that measures and values corporate performance based on an EVA framework.